Being on the #chevysxsw Road Trip Challenge was my focus last Tuesday, so I’ve already missed one #reusetues. Being tired, delusional and slightly unsure of what day (or month) it is, I didn’t want to go two for two on this one. Flaking out on your own blog back-to-back isn’t a good record to have. 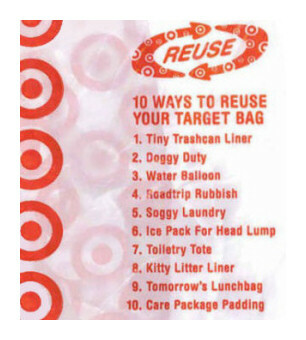 Something I always enjoyed were the ten tips on the plastic bags at Target for reuse inspiration. Staring at the one Target bag we have in our hotel room right now, they cut it down to only five points. I guess providing advice on redneck water balloons was no longer up the store’s alley. Naturally, there’s a lot more reusable tips for plastic bags than the ten provided. Share them if you have them. My tip? Don’t use them. If I have time to bore everyone later, we have some funny stories about plastic bags from our trip out to SXSW. Until then, share your reuse or recycle tips. I cringe writing this post. Books should be books, right? A recent tweet from a friend back in Detroit slapped me with the reality that Kindles and Nooks really are starting to make people second guess why they have a monster bookcase taking up space when everything fits into that little magical tablet. Make the pages come to life! SO MANY PLACES take book donations. We’re talking hospitals, prisons, libraries, local nonprofit resale stores, schools (assuming the material is audience-appropriate), homeless shelters, womens’ shelters and even to the troops overseas. If you need help finding a place to donate, let me help you out. If you have lots of books about a specific topic or genre, hone in on what audiences would benefit from your collection and ask if they’d like it. Chances are, if you’re toting around a stellar collection on plants, a local nature center or science group would be interested in taking those off your hands. AMAZING art (see all pieces on this Offbeat Earth post). Make a bookshelf OUT of books, sit on your books via a really sweet book chair or make the pages come to life – literally. Maybe pulling your book down won’t reveal a secret room, but you can hollow out a hardcover novel and make a secret hiding place for small enough stuff (instructions in this video). Book lamp? Found a ton of cool iterations here, here, and here. For the inspiration behind this blog, maybe you could make this awesome book fort for babybalanon? Need more ideas? Feed through this killer list of 80 other reuse ideas. Edit: Maybe it’s sheer coincidence, but the same guy who inspired today’s post also just became a daddy. Congrats Henry & Angela! Check out the Lion King-style photo of him with Baby Charlotte. MONSTER thanks to my dear friends who got this message via e-mail from me. The support is POURING in and I’m so grateful so many others are willing to help me do great things for good causes. xoxo. For those of you who didn’t know, I’m competing in a national road trip challenge hosted by Chevrolet next week to SXSWi (the mack grandaddy of all digital media/interactive conferences) in Austin, TX. 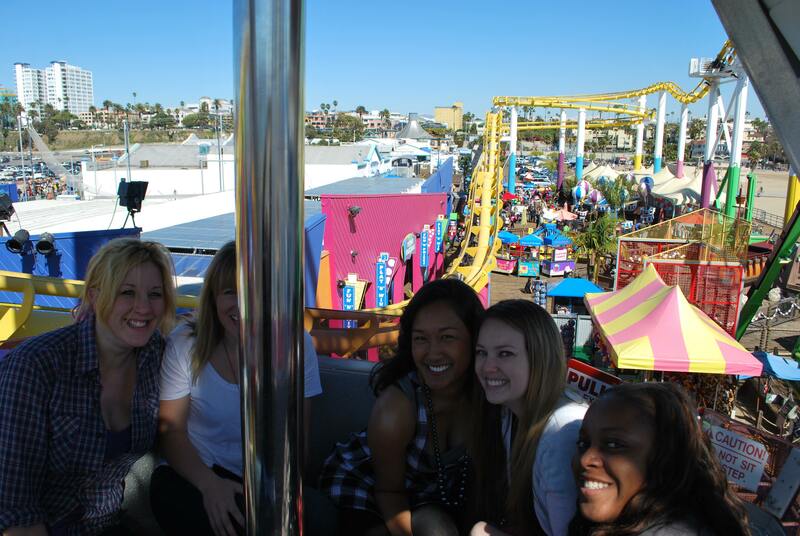 The only team representing any west coast town is ours, and is made up of me and four other awesome chicks from LA. We call ourselves the SXSWAngels to represent our final destination point and the City of Angels. What does this trip entail? Lots of the details are being kept a secret by Chevy to make our trip a little more sporadic than others, but we do know that we’ll be completing do-gooder challenges in the communities we pass through on our way to Austin. What does that mean? We could be walking dogs at a local shelter in Arizona after our lunch or making a pit stop in New Mexico to help beautify a garden. We’re not sure on the specifics yet, but we do know that we’re going to be helping others as we drive. And the whole way down, we’ll be sharing our journey instantly with our followers online. In the week leading up to the trip, all ChevySXSW teams are competing to raise funds for our national partner, Adopt-A-Classroom. This organization provides teachers additional financial support so they can provide the tools necessary for students to excel in the classroom (instead of the teachers buying everything out of their own pockets). Give by telling your story. Glass (a pretty sweet browser tool) is donating $1 for every person who writes a brief shoutout to their favorite teacher on their Facebook wall by March 10. Click HERE to like their Facebook page and share your story. We created some pretty sweet and affordable sponsorship opportunities that are still up for grabs – we made sure to make them as interactive as possible. If you want to control where we eat lunch one day or get a grasp on the gas prices along the route, consider checking them out HERE. We’re also rallying in our “a dollar per mile” challenge, hoping to raise $1,400 to represent the 1,400 miles we’ll be driving in less than three days. Want to have a chunk of road or just one mile dedicated to you while we’re on the road? Chip in via our ChipIn. If you’re in LA, come to our SXSWAngels Sendoff Soiree this Thursday at Sublime Food Lounge. A portion of all food & drink purchases will go directly to our fundraising efforts. Follow our journey! We’ve been blogging for a few weeks about our experiences as a new team, updating our Facebook and Twitter feeds (if you’re on Twitter, cheer us on using the all-team hashtag #chevysxsw), and will have a TON more platforms open for following once we’re on the road – all that information will be on our website. I hope you’ll follow our fun journey to SXSW next week (we’re on the road March 8-10) and consider helping Adopt-A-Classroom if feasible. Thanks! I tend to hold onto shoes longer than deemed allowable by society. No joke, I still wear my broken-in & treadless volleyball kicks from high school while hiking with the dogs. You think I’d learn by now, since no traction + going down dusty cliffs with strong dogs = lots of bumps and bruises. I finally started researching new uses for my old shoes because my asics are breaking down fast. They’ve been through a lot, including hiking Waynapicchu, and they deserve a proper reusable retirement. Certain brands offer in-house recycling programs, including Nike’s Reuse a Shoe program, which turns old athletic shoes and Livestrong wristbands into Nike Grind (a material with multidimensional usage, including in new Nike products, running tracks, gym floor padding, etc.). There are many regionally-focused organizations who accept mail-in donations of gently-used shoes, including (aptly-named) Donate Your Old Shoes, Soles4Souls, The Shoe Bank, Shoes for Africa and Heart and Sole (a project by our Spartan friends). If your shoes aren’t in despair (like mine), donate them to a local homeless shelter, consignment or resale shop. We hear high ankle shoes make great planters. Grow some flowers or herbs in tight spaces by using an old shoe are your garden. Just don’t like the style of your old kicks? Here’s some fun tips to “pimp your shoes” (their words, not mine). 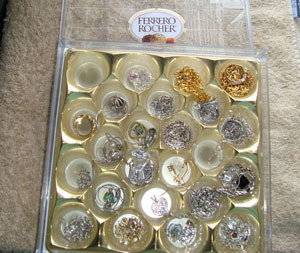 They’re so cute, but you just don’t have a reason to keep them in the closet, right? We’re talking about the hot heels, adorable flats, the shoes you wore once then never put back on. Organize a shoe swap with a ton of girlfriends to breathe new life into your fab find. Sometimes boots just don’t make sense to keep around anymore… which is why they make a great lamp. Show some love for your winged neighbors… make a shoe birdhouse. Want to let a little of your artistic side shine through? Use your old kicks as a canvas to make awesome shoe art. Yes, you could even turn your shoes into some awesome solar-powered street lights. Why not, right?